Thoroughly revised for current exam objectives, this integrated self-study system offers complete coverage of the EC Council's Certified Ethical Hacker v9 exam. Inside, IT security expert Matt Walker discusses all of the tools, techniques, and exploits relevant to the CEH exam. Readers will find learning objectives at the beginning of each chapter, exam tips, end-of-chapter reviews, and practice exam questions with in-depth answer explanations. 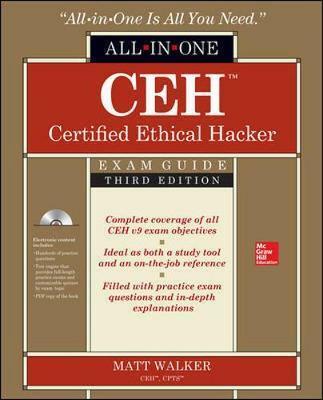 An integrated study system based on proven pedagogy, CEH Certified Ethical Hacker All-in-One Exam Guide, Third Edition, features brand-new explanations of cloud computing and mobile platforms and addresses vulnerabilities to the latest technologies and operating systems. Readers will learn about footprinting and reconnaissance, malware, hacking Web applications and mobile platforms, cloud computing vulnerabilities, and much more. Designed to help you pass the exam with ease, this authoritative resource will also serve as an essential on-the-job reference. Matt Walker, CCNA, CCNP, MCSE, CEH, CNDA, CPTS (Satellite Beach, FL) is an IT Security Architect for HP at Kennedy Space Center. He has held a variety of networking and IT Security positions, most recently including the IT Security Manager positions at Marshall Space Flight Center (SAIC contract) and Kennedy Space Center (Lockheed Martin contract).